As you may know, I try to, whenever possible, keep the food I buy/eat as unprocessed/natural as possible. Michael fights me on this. He says he isn't against it in general, just that we can't afford to not just buy whatever is cheapest. Plus, that boy loves Cheetos, Kool-Aid, etc. But sometimes, I attempt to replace his unhealthy faves with something a little better. He drinks chocolate milk pretty much every morning, and I really hated having to use Hershey's chocolate syrup, knowing all the gunk that was in there. So, when I found this recipe on Annie's Eats, I was ecstatic! I made it almost right away! Now, this chocolate syrup still isn't healthy, but it certainly is A LOT better! There are only a handful of ingredients, and you more than likely have all of them already. Plus-this syrup has a much richer, tasty chocolate flavor, so you can use less than you normally would! Michael even admitted it's better than Hershey's. Use this chocolate syrup for drinks, over ice cream, or whatever you normally use chocolate syrup for. 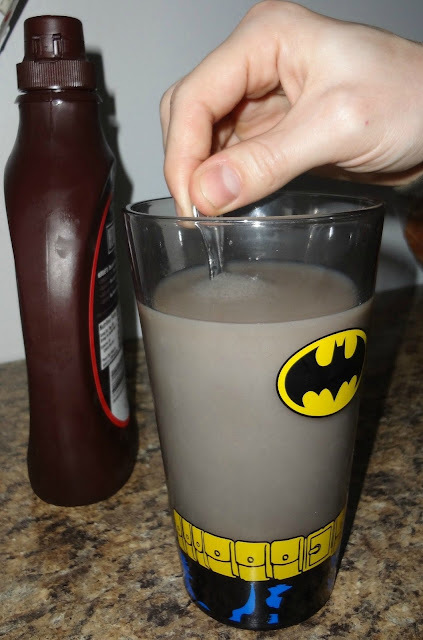 From Annie's Eats "DIY Chocolate Syrup"
In a medium saucepan combine sugar and cocoa powder. Whisk to break up clumps. Stir in water and salt and bring to a boil over medium-high heat, stirring frequently. Once the mixture boils, reduce heat to medium-low and simmer until slightly thickened (about 5 minutes). Pour into some sort of serving bottle-you can purchase glass ones, or (if you're me) just use a leftover chocolate syrup bottle. **Note: if you're new and don't realize: Michael is my boyfriend, not my son. I'm only 22 lol. I realize the Batman and love for junk food make him seem 5, not 25, but I promise, he's a grown up! Lol. Also: If you're interested in having a super cool Batman glass, like the one above (which my brother gave Michael for Christmas) you can get it at Spencer's. Who even knew you could make this stuff at home? YUM!!!! Definitely better than the store bought stuff ... Love the batman glass! Kudos to you commitment to watch the kiddos diet. It can be hard with all the conveniences. It is even hard for me to find a low sodium granola cereal. I guess it is a constant reminder to make things at home! This may be chocolate, but at least it is made up of real ingredients. Enjoy the day! Hopefully Michael appreciated this--so much better-looking than boring Hershey's syrup! For real, Kayle! I'm going to use this. I gave up the chemically made "chocolate syrup" - saving yours! :-)) Yaaay! We're the same way - I'd love to buy all organic and unprocessed but my budget doesn't allow it. Annie's Eats has a really great recipe for a pumpkin spice syrup which is incredible too! This chocolate sauce looks incredible! i just nominated you for an award! check out my blog to receive it! Duuude I loove the Batman glass! And I never thought how handy the chocolate syrup ingredients would be...(I just bought Nesquick a couple days ago grr ) but yay now I can just make my own! Yes, I'm totally making this. Like Michael, I love chocolate milk. It's really the only way I can drink milk. I like that it doesn't have all the unnecessary additives that you can't pronounce because they're like a hundred letters long. Love the batman glass! Haha, I love that Michael drinks chocolate milk for breakfast every morning. That makes me smile. 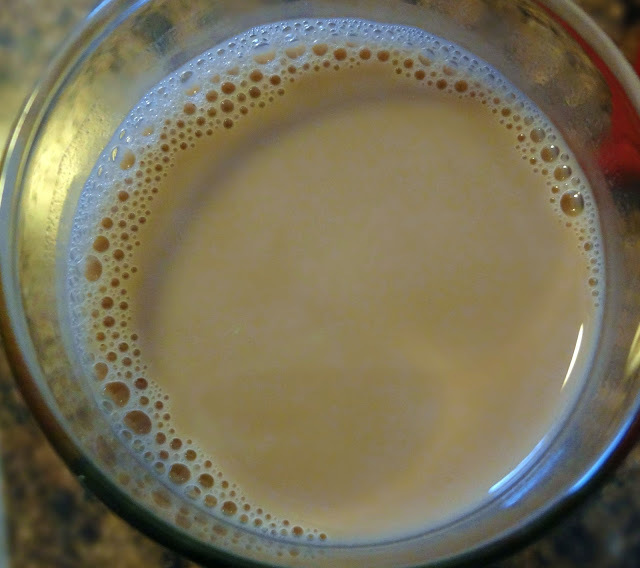 I am so glad you found a homemade and delicious substitute for Hershey's (I agree, yuck). Same sentiments Kayle...As much as possible, we'd want to have everything homemade. This is a really great addition to my homemade treats file. Thanks! I do hope you are as thrilled as I was to receive these awards. I have to admit that at one point I did think that Michael was your son. I didn't know how old you were and you referred to him as 'my boy' so.... lol.